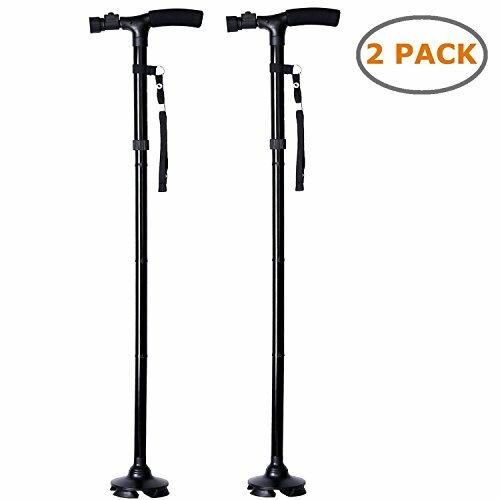 Ohuhu 2-Pack Folding Walking Cane with LED Light, Adjustable Walking Stick with Carrying Bag by Ohuhu at H For Care. MPN: unknown. Hurry! Limited time offer. Offer valid only while supplies last. The Ohuhu LED Folding Walking Cane is versatile and easy to use in the darkest and bumpy places with its angled lighting and strong grip and build. The Ohuhu LED Folding Walking Cane is versatile and easy to use in the darkest and bumpy places with its angled lighting and strong grip and build. It comes with a carrying bag for ease in storage and convenience while travelling. The ergonomic lightweight design paired with the adjustable height levels make it the perfect walking and support companion.